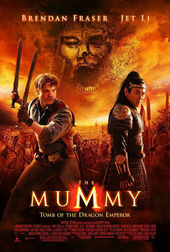 I hate mummies. They never play fair. What immediately comes to mind upon viewing these end titles as a stand-alone element is that there is great discipline in the master calligrapher's graceful, yet contrasting, Chinese brush strokes. His magic carpet ride reminds one of Masaki Kobayashi's Hoichi the Earless, only here the Chinese characters – and Kanji, respectively – become life-taking daggers rather than a life-saving shield. I am reminded also of splattered ink at the point of impact and the panning flight of a classic aircraft, both owing debt to El Don, in addition to the 300 main-on-end titles and to Frank Miller. While some frames seem partially rendered (exploding diamond? the odd alignment and spacing of the trekkers? an uninspired mouth of a cave? ), others offer flashes of originality (snake-strokes from a blood sun, lettered mountaintop, inkblot blood of fleshless adversaries, a halved opponent, yetis in profile).